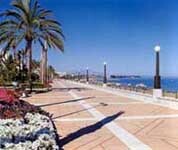 Estepona Malaga - From Malaga airport to Estepona. 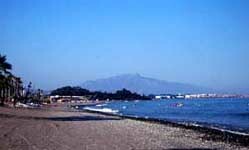 Estepona is a municipality located next to Marbella, to the west of the Costa del Sol. It’s a popular tourist destination, especially in summer, as it’s an excellent place to spend our holidays due to its wonderful beaches, fantastic climate and accommodation offer, where we’ll find great hotel offers in Estepona. The name of the municipality comes from the Celt’s cult to the goddess Epona, being a place with a great cultural legacy thanks to its natural port. Inhabited already from the prehistory, it has left us silex tools, dolmens, Iberian and Roman remains, as well as Muslim architectonic elements. The beaches of Estepona have thick sand, and amongst them the following stand out: Rada, El Cristo, Bahia Dorada, Galera, Padron, the Beaver river and the popular Costa Natura, a nudist beach recognised all over Europe. The climate in Estepona is typical Mediterranean, which means it’s mild all year round. Due to its proximity to Gibraltar, the rainfall in Estepona can be slightly higher than in the rest of the province. The old quarter, despite the time gone by, maintains all the essence of a typical Andalusian village, with narrow streets in line with the coast, just as how they were traced in the 18th and 20th century. 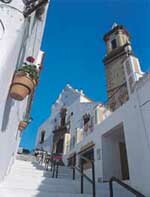 By strolling through Estepona we’ll discover a bit of its history, of its cultural legacy. If we’re travelling with the whole family, a visit to Selwo Adventure is highly recommendable. It’s situated on the Costa del Sol motorway, which is why if we’re travelling in our own vehicle it will be easier for us to get there. In this park, the wild animals live in an environment in semi-freedom and there are over 2000 different species to be seen. From the Pedregales Park we can enjoy some breath-taking views of the African coast and Gibraltar. If we’re into sport, we can go cycling, horse-riding and trekking. Buses to San Pedro de Alcantara, Marbella, Benalmadena, Torremolinos and Malaga will help us travel throughout the Costa del Sol, and an inland line will take us up to Casares. From Estepona there is also a bus line that reaches La Linea de la Concepción and Gibraltar. The municipality is somewhat further away from other important tourist centres in the province, and spending our holidays using the public transport can be quite an unpleasant situation for everyone. From here we recommend to check out our prices with no obligation nor cancellation fees, just use the links below to hire a car when you arrive at Malaga airport. Town council: Avda. San Lorenzo, 1, 29680 Estepona. Phone: +34 952 80 20 02. There is a 82 km journey to Estepona (about 50 minutes by car). Find the cheapest Malaga car rental prices and see how to get from Malaga airport to Estepona. If you do not need to hire a car, you can check prices from us also for a Malaga airport transfer to Estepona.